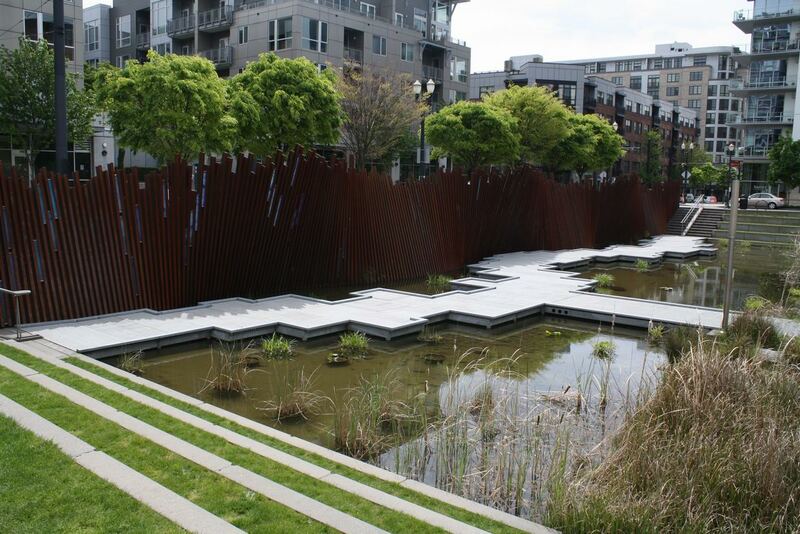 Tanner Springs Park, in the Pearl District of Portland, Oregon, is a unique example of ecological sustainability within an urban area. 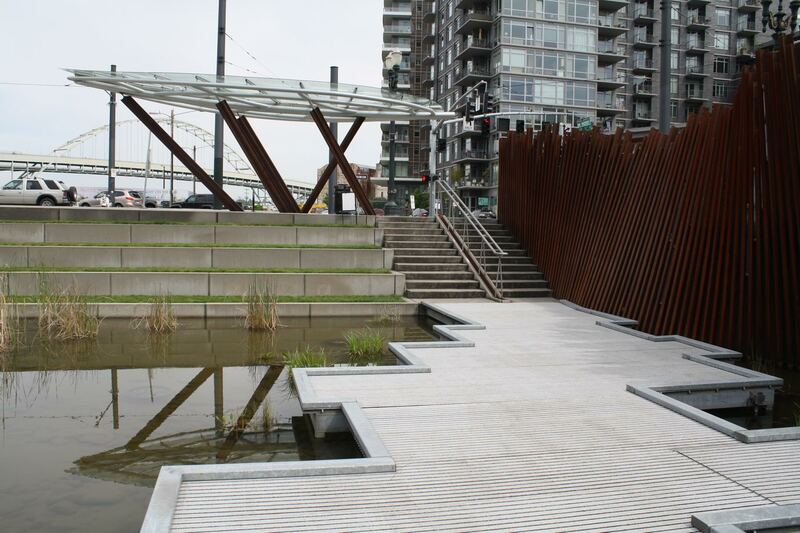 It was built on a former industrial site, and a natural habitat was created to represent the historic ecosystem that existed in this part of the Willamette River valley prior to development of the city. 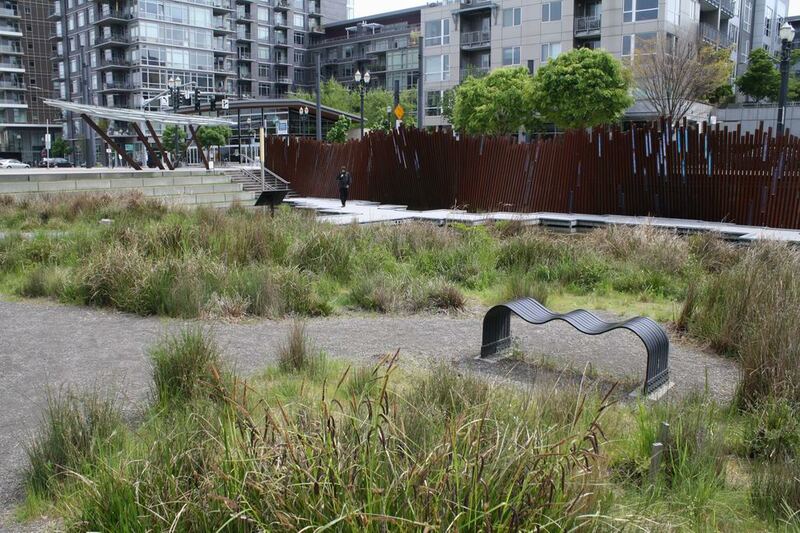 The site slopes down from west to east, and the western end is planted with trees to portray an Oak savannah prairie. A native grassland was planted downhill from the savannah, sloping down into a wetland, and ultimately to a pond at the east end of the park. All rain water that falls within the park boundaries is cleansed and recycled on site. Water seeps into the soil, migrates to a subgrade cistern, and is then treated by an ultraviolet light system, also located under ground. 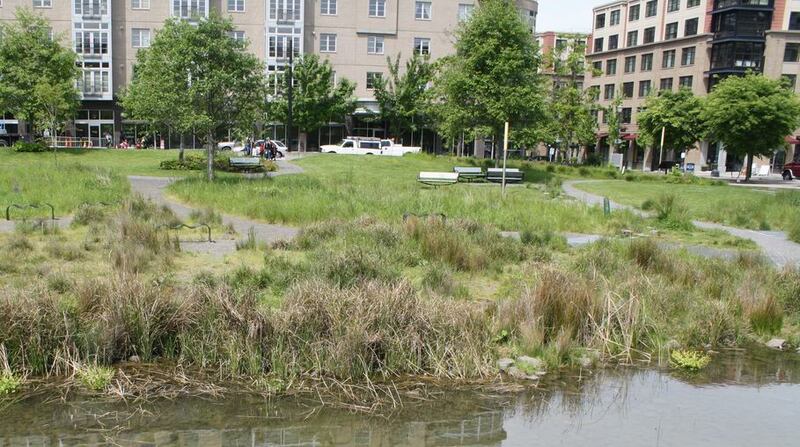 The clean water then emerges as a “spring” in the grassland, and flows through a meandering runnel into the pond. 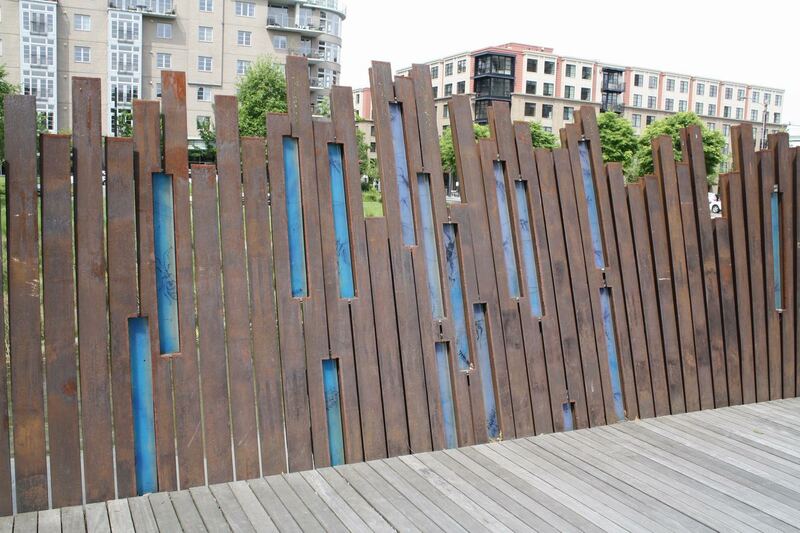 Some materials installed in the park also represent the industrial past of the city. Belgian blocks that pave some of the walkways were originally used as ballast on ships that navigated the Columbia River, and later used as surfacing for Portland’s streets. Also, an art installation at the east end of the park consists of a wavering wall of vertical rail tracks, interspersed with blue stained glass panels displaying images of insects – a merging of man-made and natural references. The rail tracks are relics of 19th century Portland. A “spring” emerges from the ground in the prairie zone. 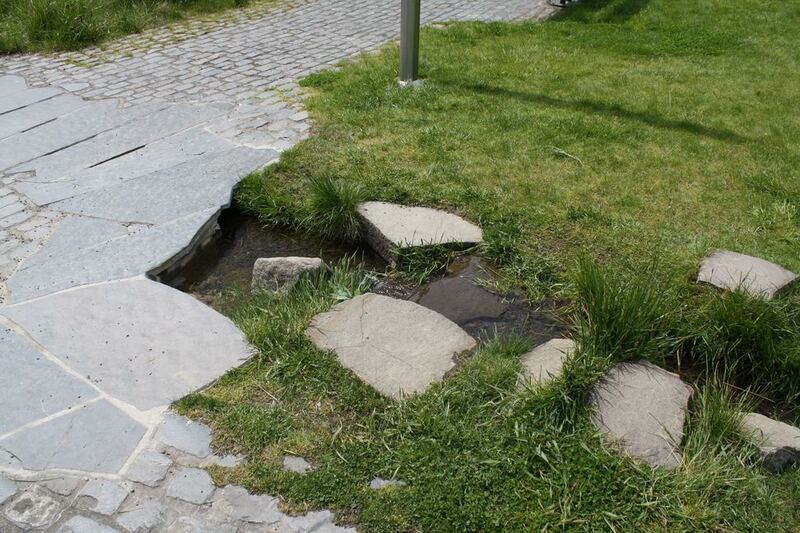 Water flows from the “spring” through a winding runnel. 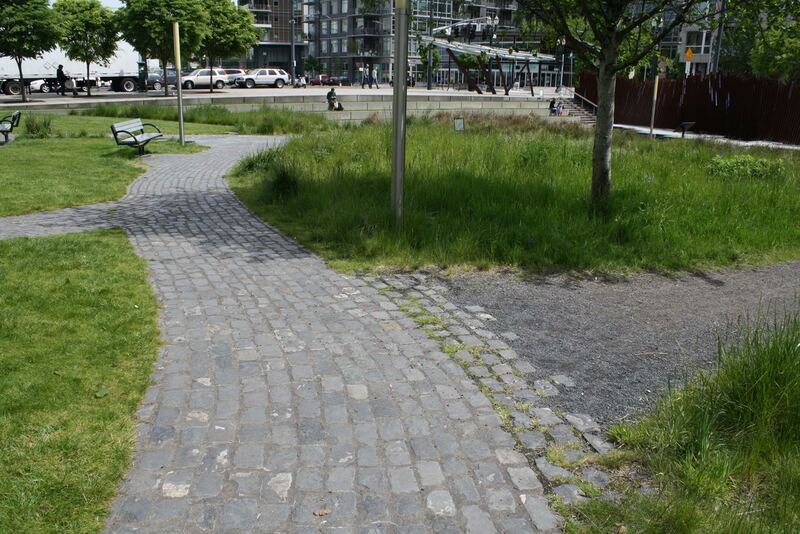 Cobbled walkways transition to stone dust surfacing in the grassland zone. A pond is situated at the east end of the park. 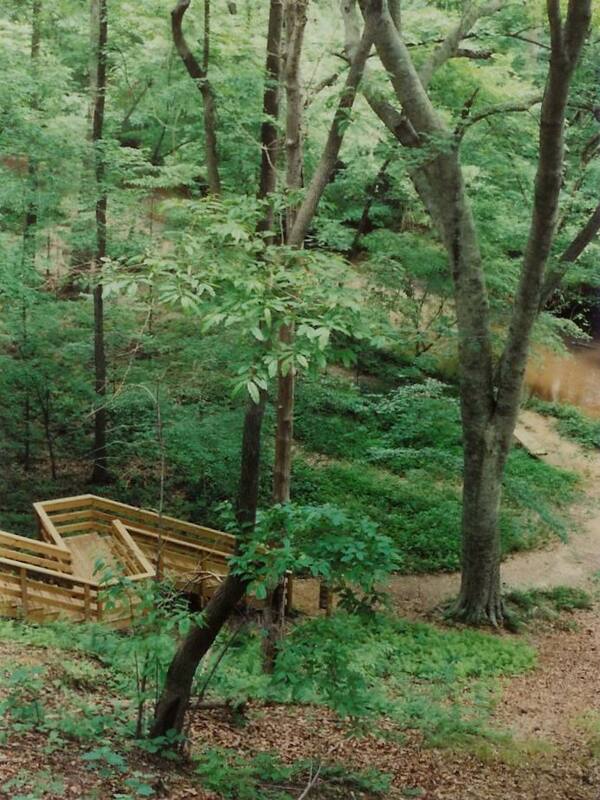 About 20 years ago, I designed a system of trails, observation decks, steps, and boardwalks for a 136-acre nature preserve in Cary, North Carolina. 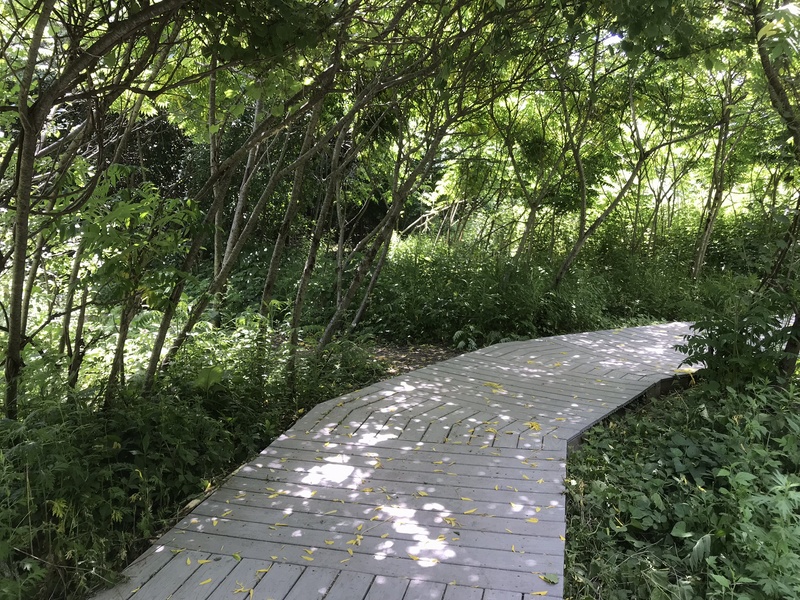 It was an absolute delight to work on this project, because Hemlock Bluffs is such a magical place – a natural oasis within an area of suburban development. 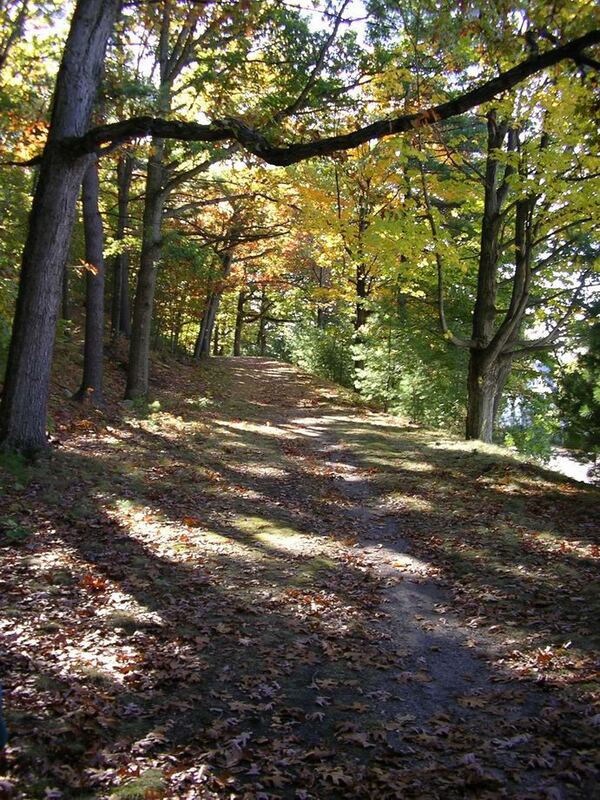 It features a series of tall north-facing bluffs that shelter a community of Eastern Hemlocks. This is unusual because these trees typically do not grow naturally in the piedmont region of North Carolina – this species is much more common in the cooler Appalachian Mountains more than 200 miles to the west. In addition, the preserve includes an extensive upland forest and a wooded floodplain area with vernal pools and a rich variety of plants. A system of steps takes visitors down along the bluffs. 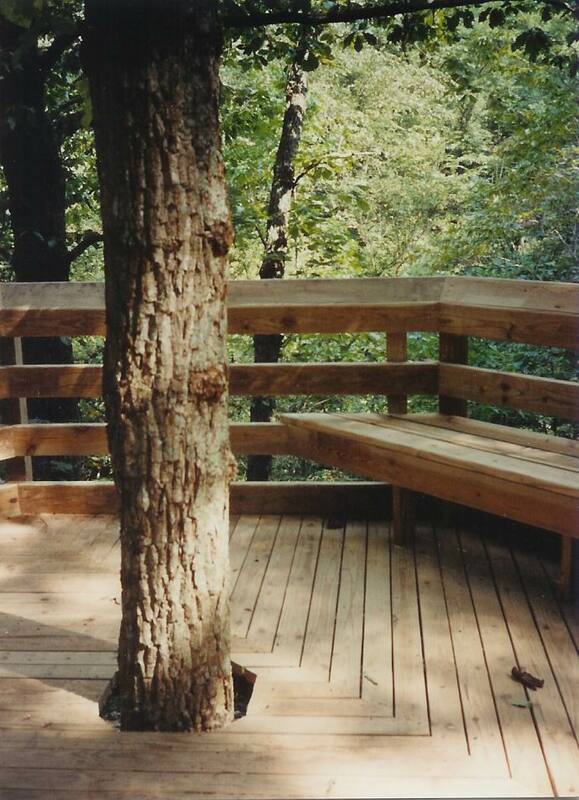 One of several observation decks affords views of large Hemlock trees growing on the bluffs. 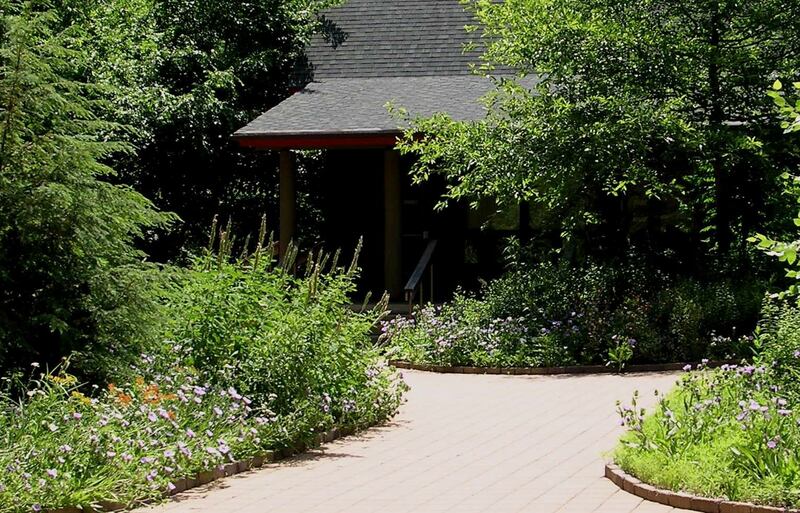 Plant beds near the Stevens Nature Center building are filled with native wildflowers and trees. A boardwalk meanders through a lush floodplain. Worcester, Massachusetts, is known for its numerous hills. 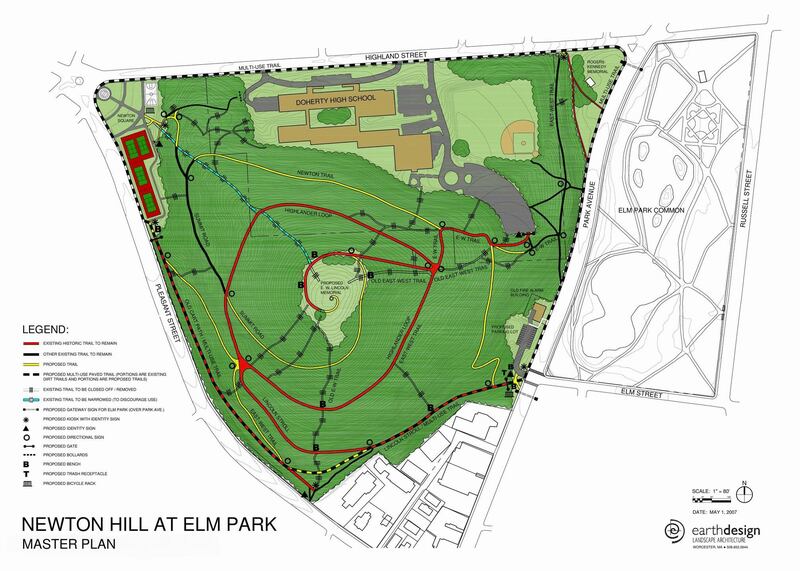 One of those high points, called Newton Hill, is part of historic Elm Park. 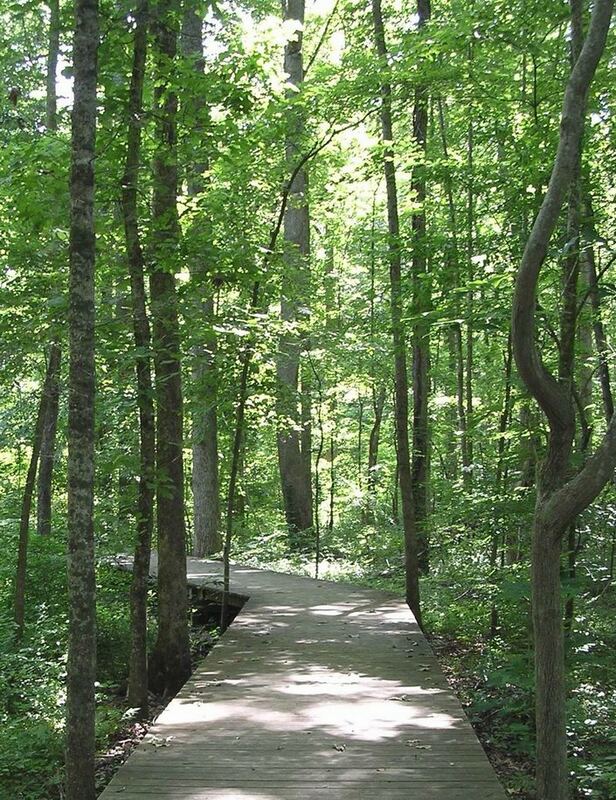 It was acquired by the city in the late 1800s and a system of trails was built at that time. My company, EarthDesign Landscape Architecture LLC, designed a master plan for Newton Hill in 2007, which retains the historic trails (shown in red in the plan above), adds some new ones, and eliminates steep unplanned paths. A paved multi-purpose loop trail is also proposed along the perimeter, near the street level, and improvements are recommended to trailheads along the adjacent streets. 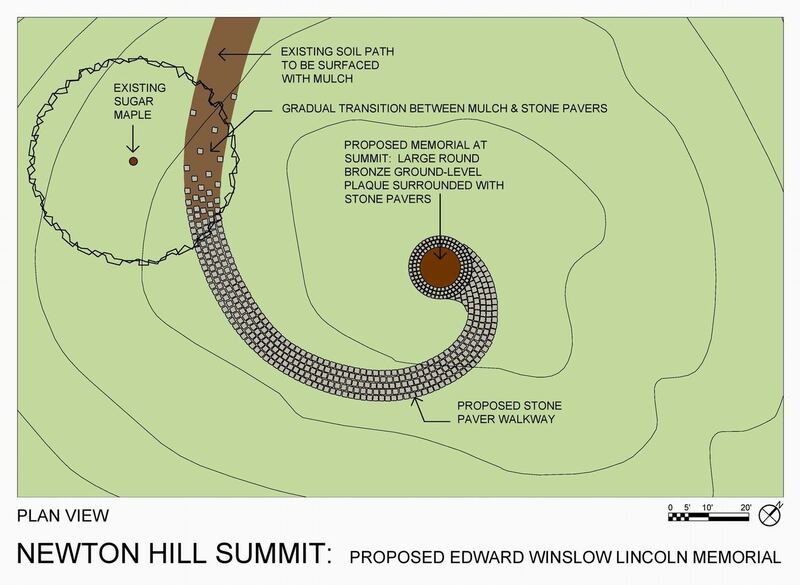 In addition, a memorial at the top of the hill is planned that will celebrate Edward Winslow Lincoln, the chairman of the Worcester Parks Commission for 26 years in the late 1800s, who was instrumental in the city’s acquisition of the Newton Hill property. 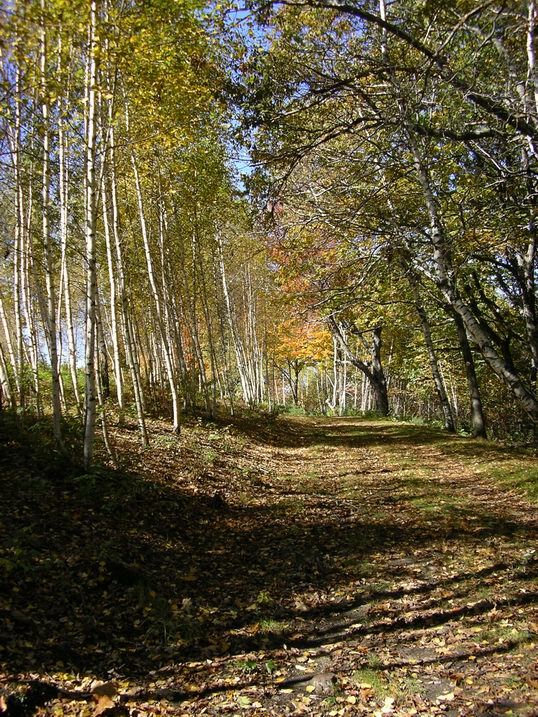 The original system of trails gradually winds up the wooded slope, and one of these pathways fades out where the forest opens up to a grassy summit. The plan includes a continuation of this trail, to be surfaced with stone pavers, spiraling up the hillside and terminating at the memorial site at the top (as shown in the plan detail above). 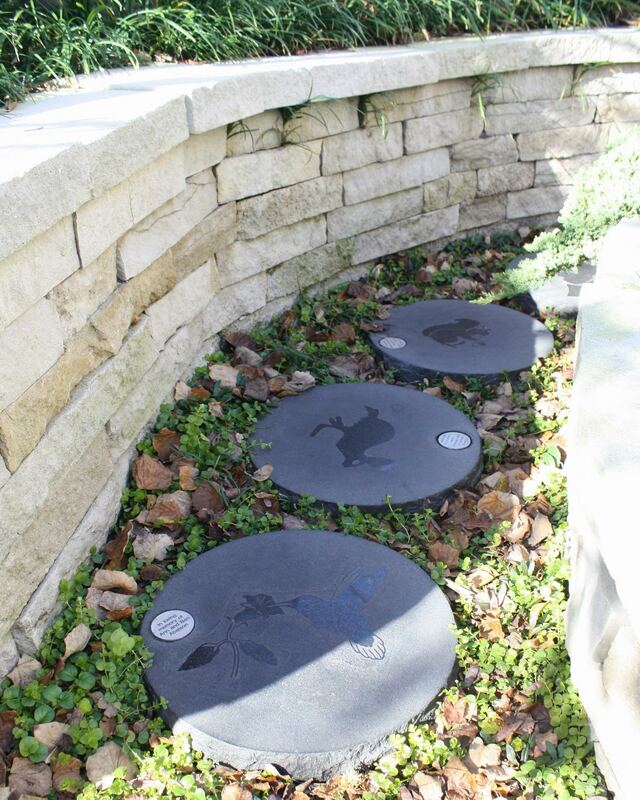 All components of the memorial would be at ground level, for two reasons. First, we wanted it have a low visual impact on the landscape and to contain an element of surprise, not revealing itself until one reaches the top of the hill. Secondly, we wanted to avoid including any vertical elements that might be attractive to vandals, mainly because a high school is situated adjacent to the park site. This trail is close to where the forest opens up to the grassy summit. One recommendation of the master plan is to selectively thin out some of the smaller trees in spots to open up views from the summit. Not much of the plan has been implemented to date, due to lack of funding. 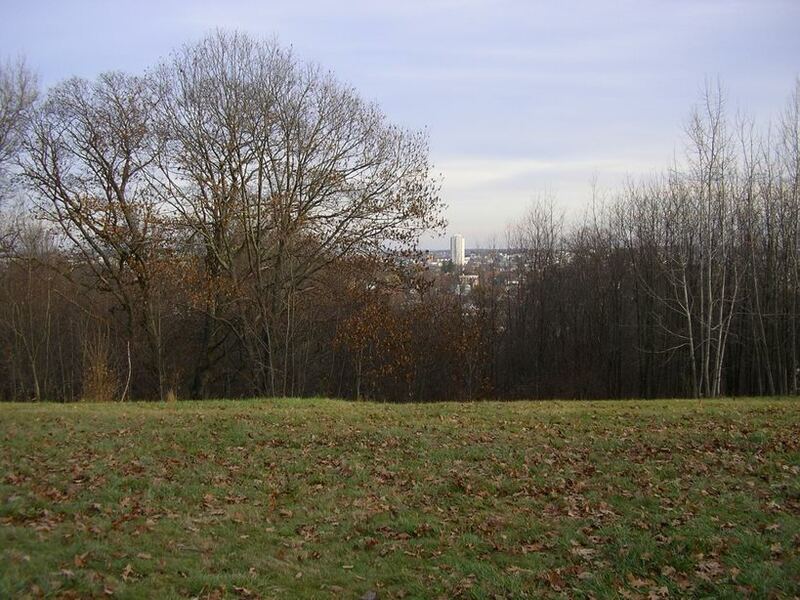 However, a signage system has been installed, and the non-profit Friends of Newton Hill has continued efforts to raise money for the project and to keep the site maintained. 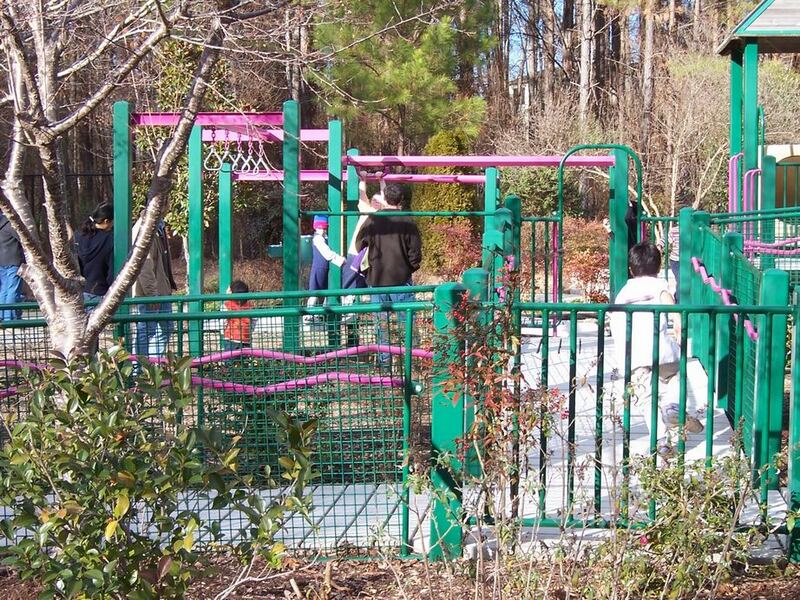 In my former position as a landscape architect for the Town of Cary, North Carolina, I had the pleasure of managing the design and construction of a unique and extensive play space, called Kids Together Playground, which is located in Marla Dorrel Park. 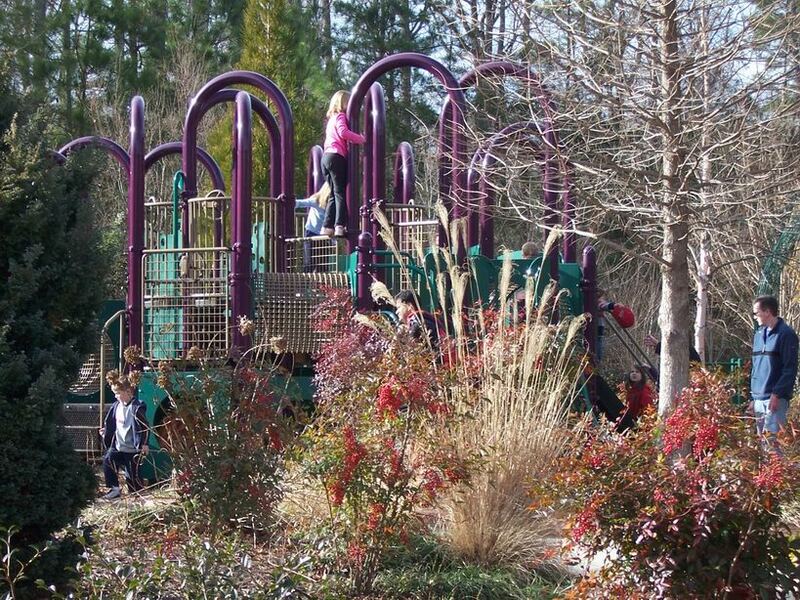 The playground is two acres in size, and was completed in 2000. Its defining features include a universally-accessible design, in addition to many natural elements, including plants, sand, rocks, and rolling hills. It includes both active and passive (“discovery”) play zones, as well as separate school-age and preschool-age areas. 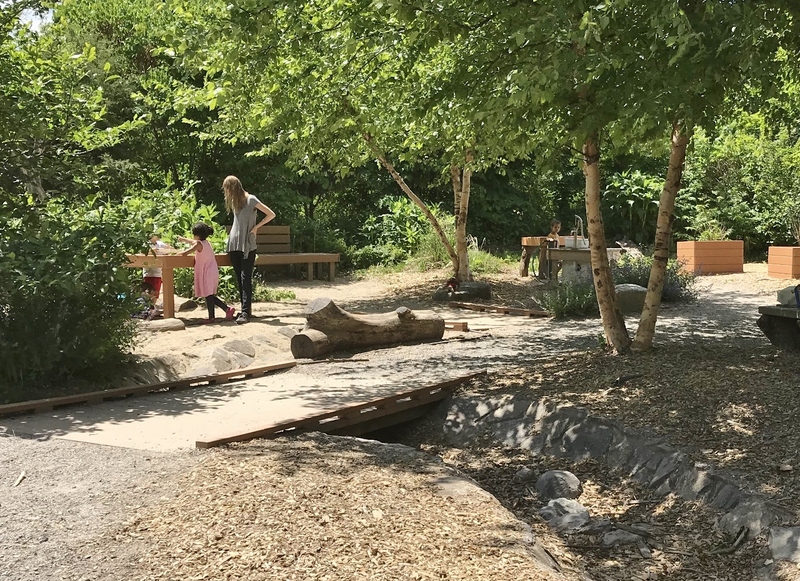 The park and playground were designed by my friends at Little & Little Landscape Architects in collaboration with Robin Moore, Director of the Natural Learning Initiative, both in Raleigh, NC. Integrating play opportunities for children of all ability levels was the original goal behind the development of this playground. It consists of many accessible pathways throughout the site, and more than half of the raised decking on the largest play structure can be accessed by wheelchairs via two ramps. A raised, terraced sand table also accommodates wheelchairs, and swings with back support are mixed in with traditional belt swings. 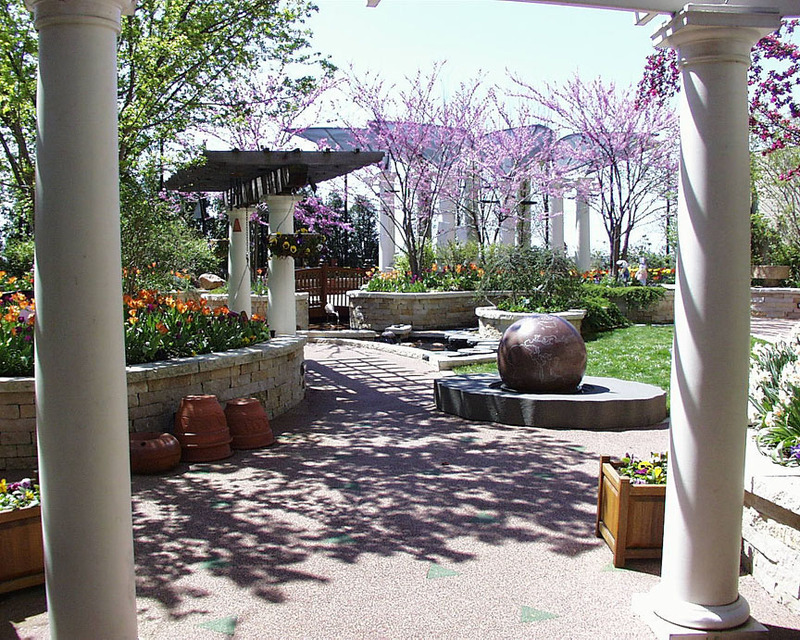 Changes in walkway surfacing provide textural cues for the visually impaired at intersections and steps, and plants stimulate the senses of sight, touch, and smell. 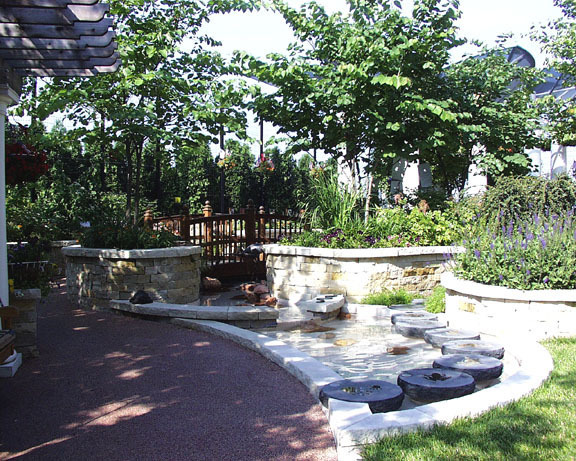 Natural elements in this playground are plentiful, and provide many creative play opportunities. 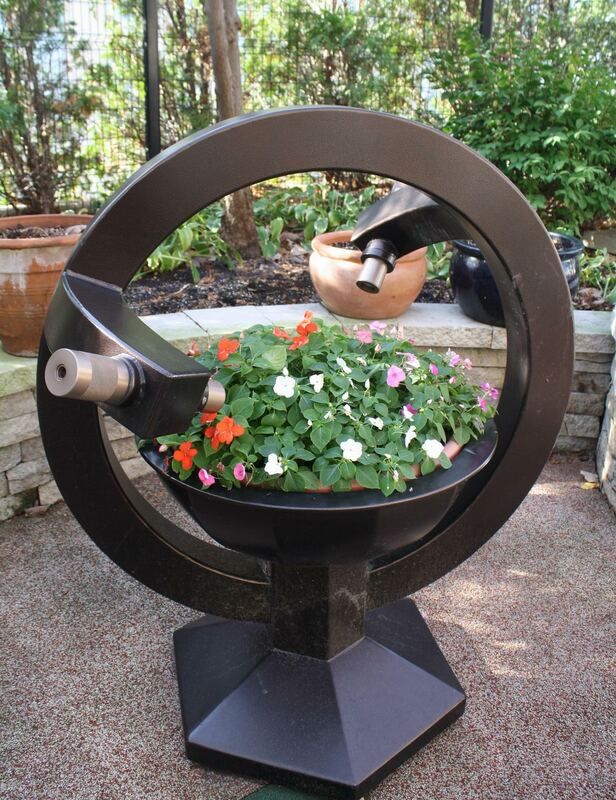 There is a large variety of lush plantings, including ornamental grasses, shrubs, trees, groundcovers, and perennials. The plants were chosen to provide a diversity of colors, textures, and fragrances through various seasons, and all are non-toxic. 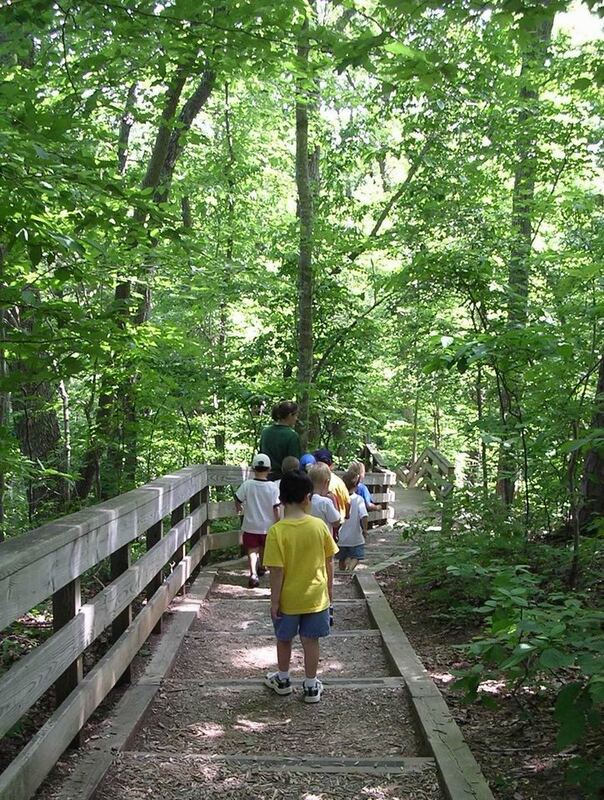 Trees provide shade in this warm climate, and many of the plants offer loose parts for imaginative play. 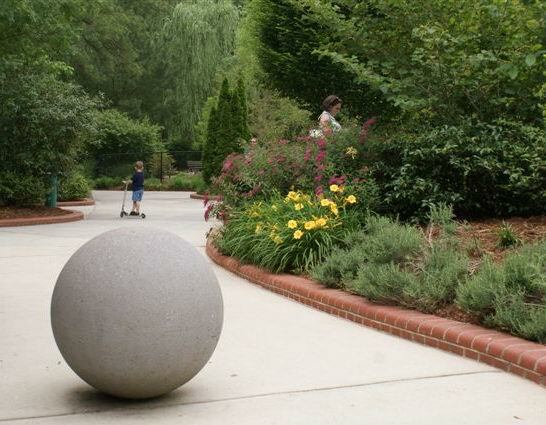 Shrubs and tall grasses also form the boundaries of play spaces, and are perfect for hide-and-seek games. 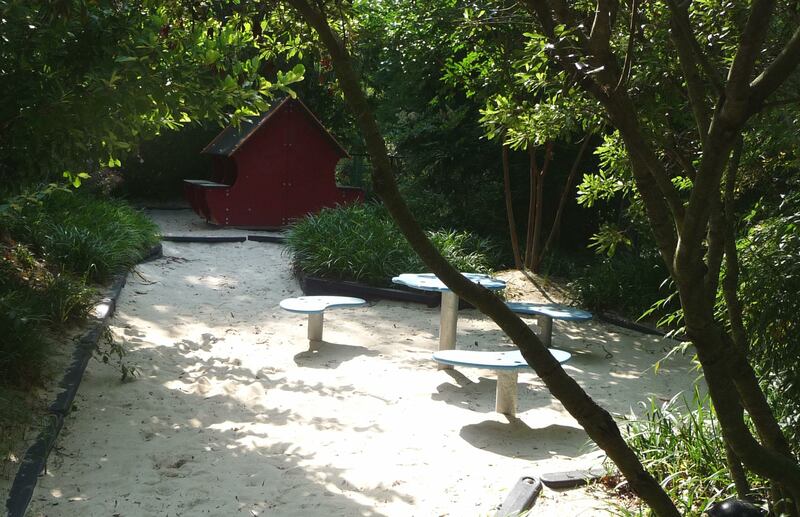 In addition, there are three sand areas in the playground, including a sand “river” that runs under a footbridge, a zone with sand diggers, and the terraced sand table mentioned above. Also, rocks are set into hillsides for climbing and sitting, and grassy slopes are provided for running, rolling, and relaxing. 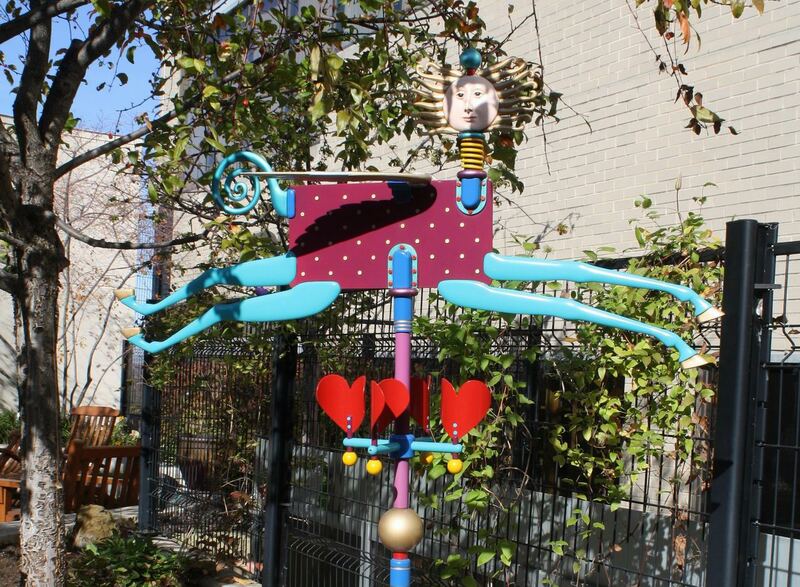 Playful pieces of original artwork can be found throughout the site. 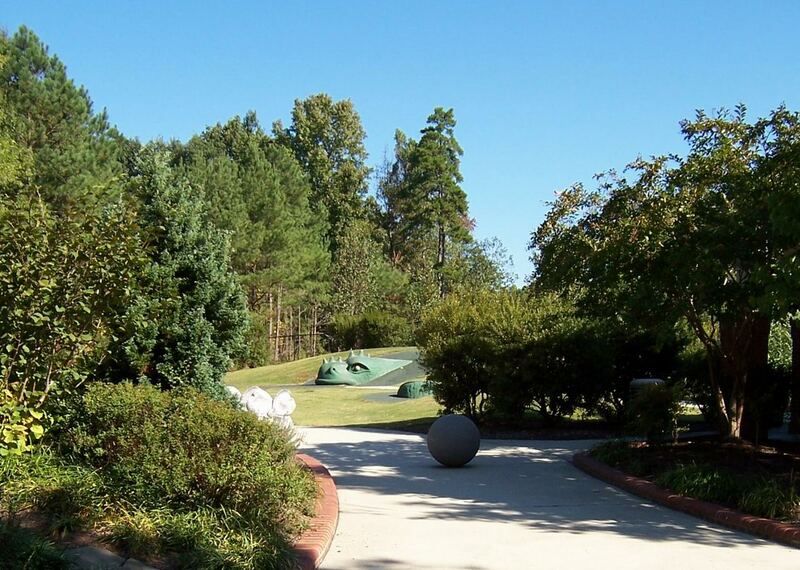 A climbable dragon sculpture emerges from a hillside, and matching benches that flank the entrance area invite kids to talk to each other through winding tubes. Benches with botanical and dragon themes also can be found along several of the walkways. Kids Together Playground continues to be very popular, since it provides such a wide variety of play opportunities for kids of all abilities. 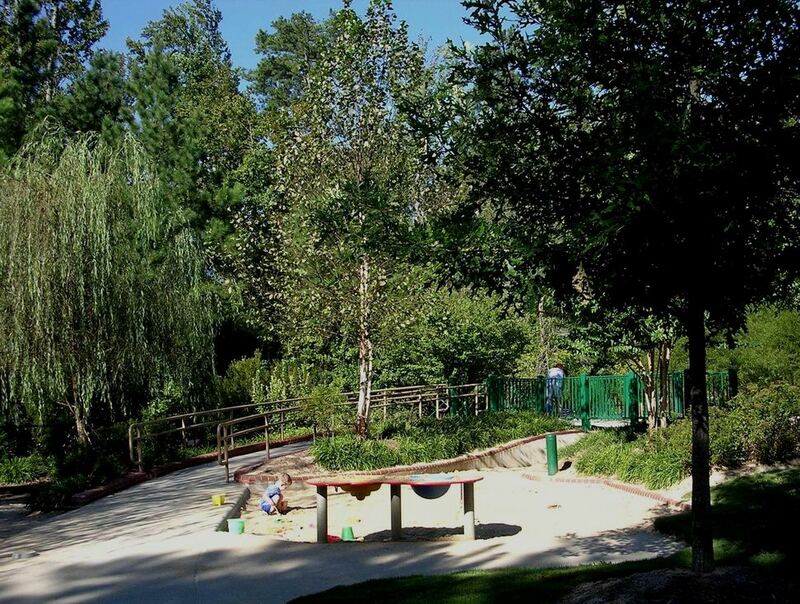 Although traditional climbing, sliding, and swinging structures are included, this playground also offers many settings for creative play, ranging from sand areas and playhouses to winding paths and hills. 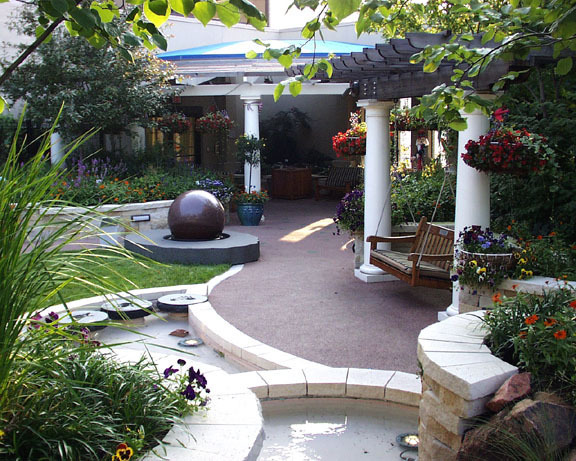 Plants, however, are the dominant features of this site, and add a tremendous amount of play value and visual appeal. 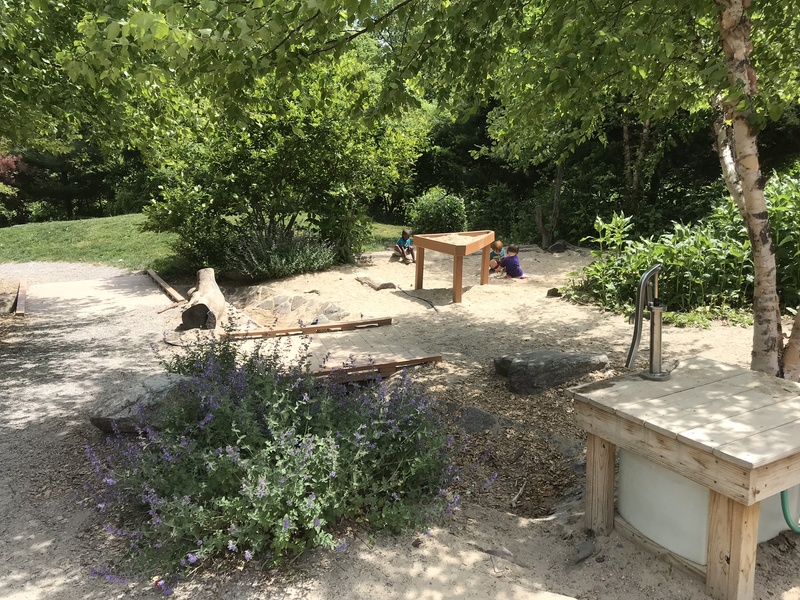 The beginning of a sand “river” in the preschool play zone includes a wheelchair-accessible table and a “bucket filler” water source. The sand “river” continues under an accessible bridge in the preschool area. A climbable dragon sculpture emerges from the hillside. The playground’s plants have ornamental appeal in the winter, too. Ramps to the large play structure are surrounded by vegetation. I’m a strong advocate of giving kids opportunities to play in natural settings, and am working on convincing more of my clients to include natural elements in children’s playgrounds that I design. Last year I wrote an article about this topic for the New England Park Association’s spring newsletter, which is abbreviated below. Many of today’s children spend too much time indoors or in planned activities, which has led to high levels of attention disorders and depression. 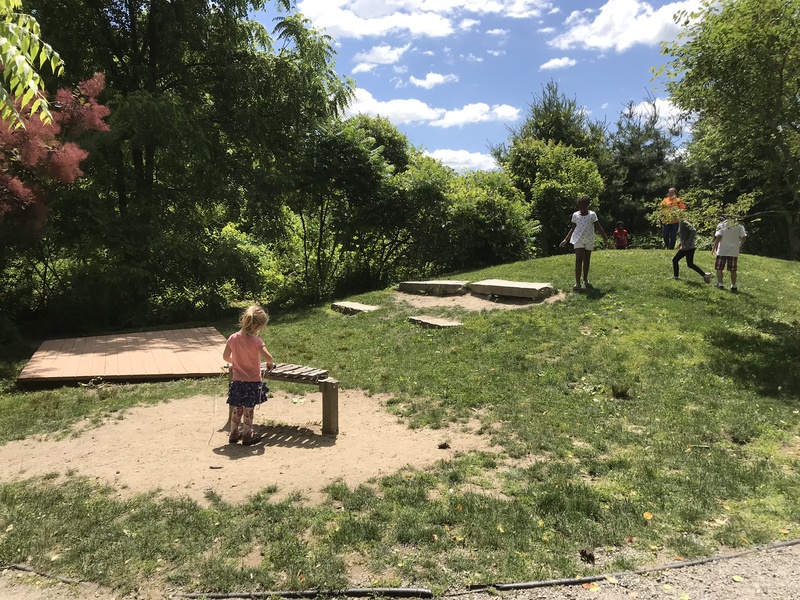 Unstructured outdoor play is very important for kids, as there is a growing body of scientific evidence that free play, particularly in natural settings, has many cognitive, social, and emotional benefits. 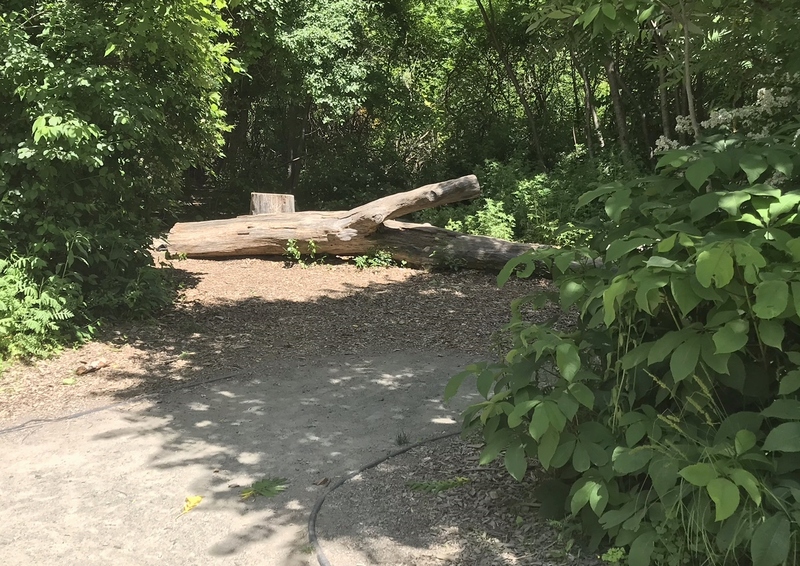 One solution is to allow children to play freely in natural areas, but to go a step further, natural features can be incorporated into playgrounds. In contrast to open natural settings, playgrounds can provide a more secure, bounded area which adults may prefer, particularly for younger children. This objective can be met by providing natural settings and elements in the play area, such as grass hills, sand play areas, water, rocks, plants, and wood. 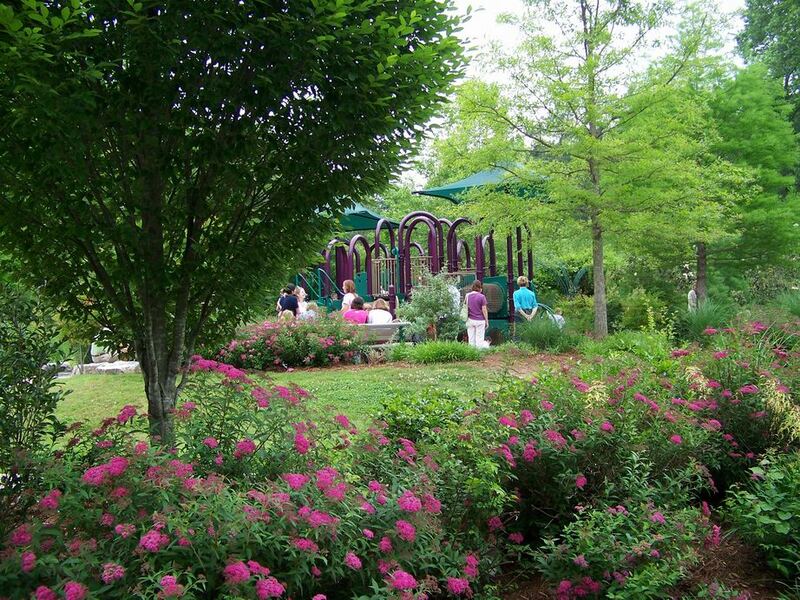 Of all the natural elements that can be provided in playgrounds, plants are one of the most beneficial. 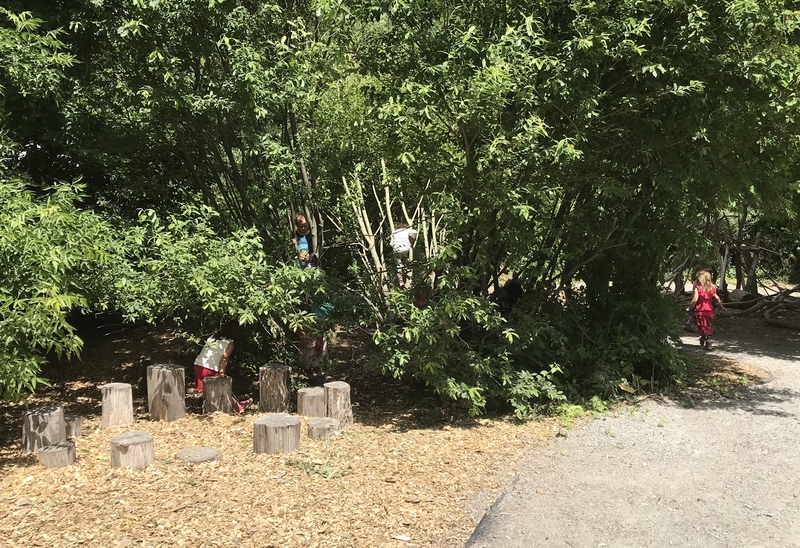 Shrubs and tall ornamental grasses are great for hide-and-seek games, and plants of all types can provide loose parts for imaginative play, such as cones, seeds, leaves, and sticks. They can also form the boundaries of play spaces within a playground. Plants help to develop the senses, they stimulate exploration, and they foster appreciation for the natural environment. 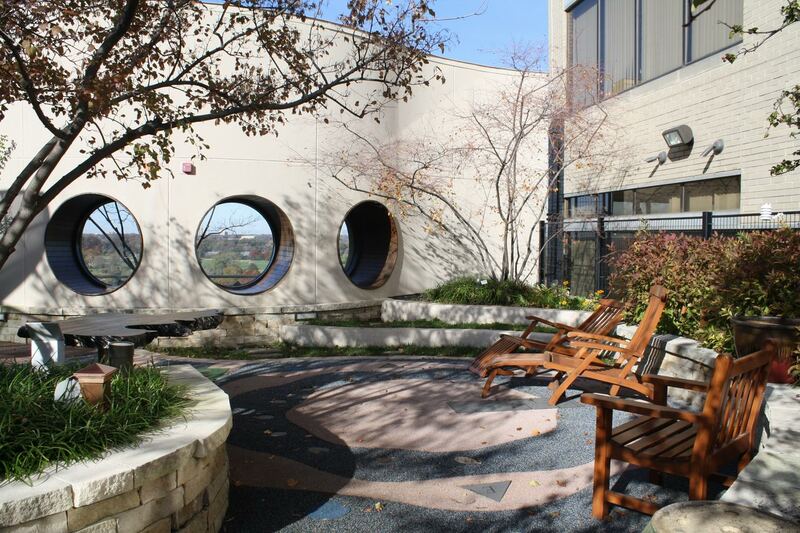 Other advantages include protection from sun and wind, erosion control, and making the playground more visually attractive for both children and adults. Including hills and other variations in topography can promote a lot of enjoyment in playgrounds. 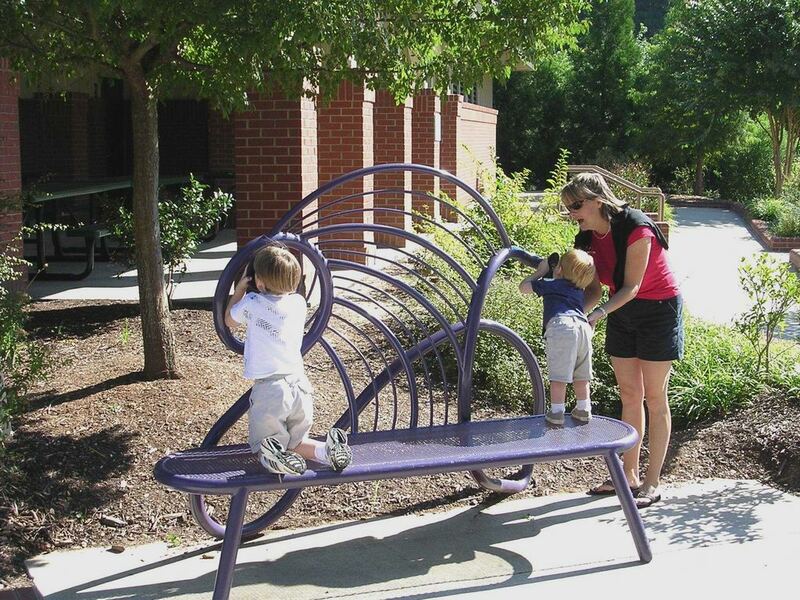 These provide varied spatial experiences, and encourage climbing, running, and rolling. Slides can even be incorporated into hillsides, and accessible routes can be constructed to the tops of these slides. 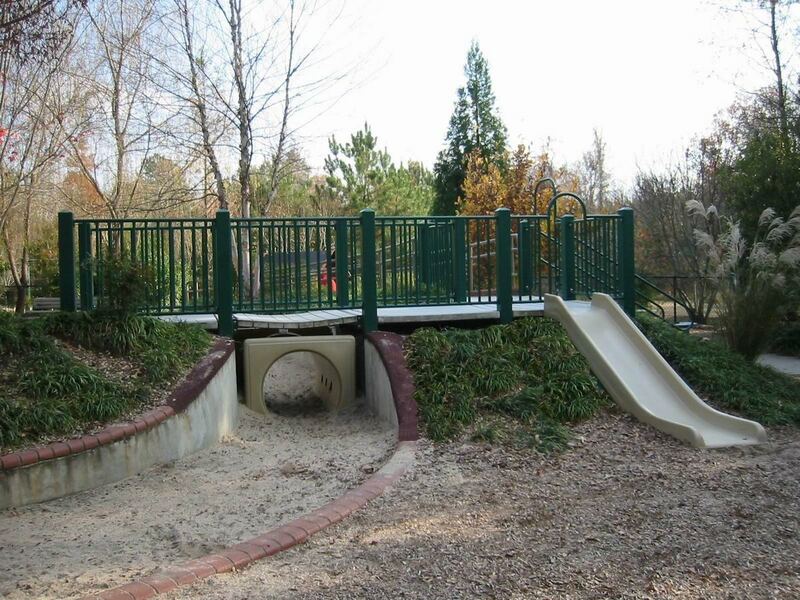 Bridges can also be built between a hill or higher elevation and the upper level of a play structure, which facilitates wheelchair access into the structure, and adds fun to the play experience. Hills and mounds make a playground more interesting, and are also great for sledding in winter. Sand areas are very popular with younger children, and they foster creative play since sand can be molded into all types of things. It is important to include a water source in the sand area, such as a button-operated or pump-activated “jug filler”, for this purpose. 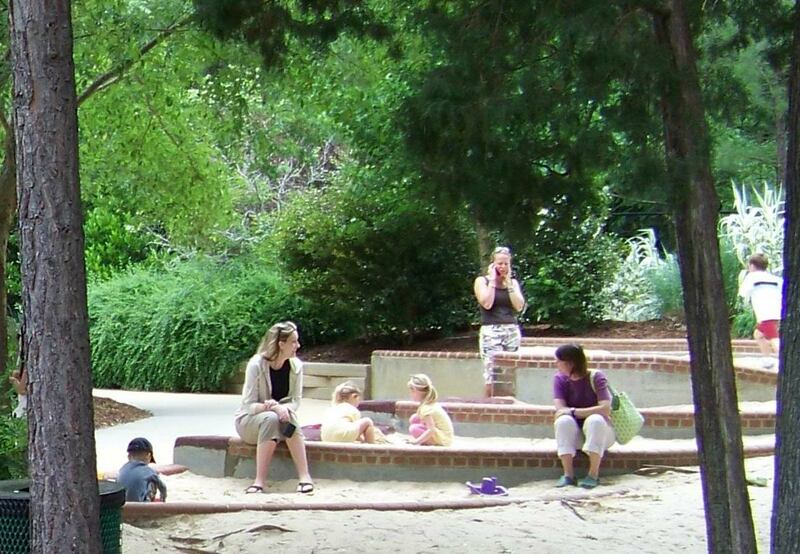 Sand play areas are also great for social interaction among children. For wheelchair accessibility, raised sand tables can be provided, or an entire sand area could be raised to allow wheelchair users to transfer onto the edge and into the sand. 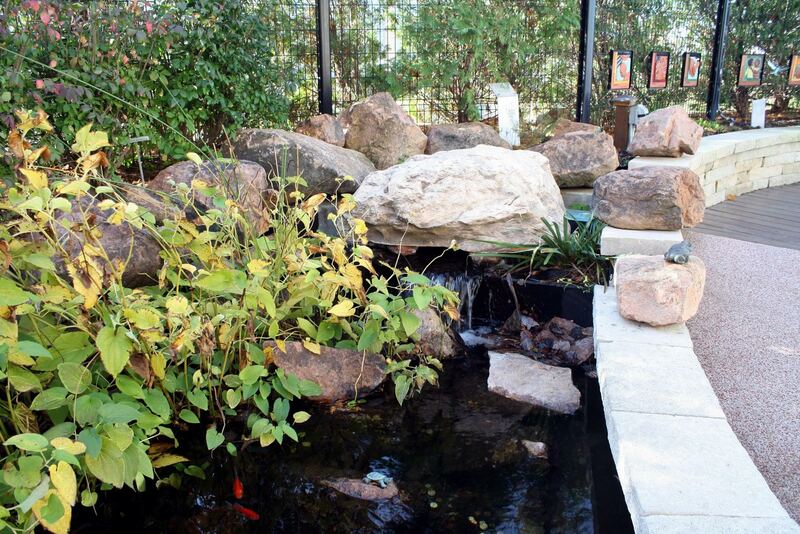 Water features can also greatly enhance the play experience, particularly if they mimic natural aquatic systems. Devices activated with buttons or pumps could be used to discharge water into a shallow hard-surfaced channel at ground level or a series of raised troughs or terraces. These could be built in combination with spray elements, and all of this water could then be chlorinated and recirculated. 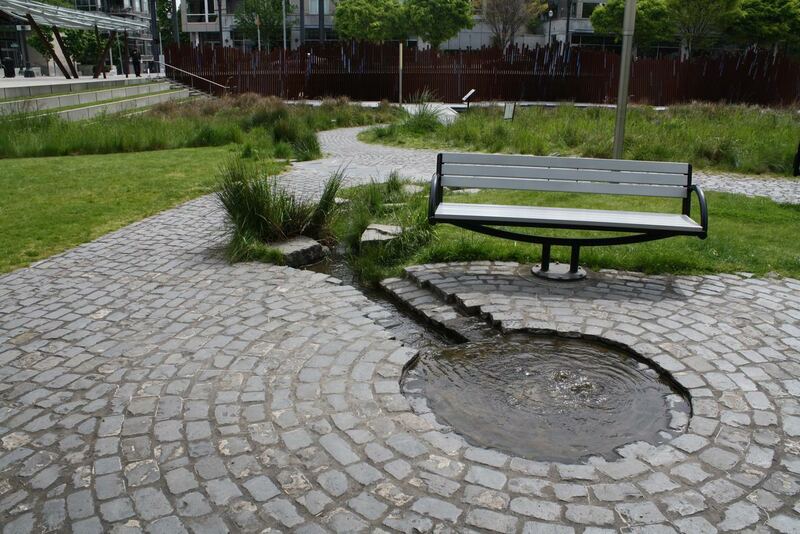 If safety is a concern, all of these water play features could be zero-depth. Rocks and wood are other natural elements that are fun and engaging, and they can be inexpensive to incorporate if obtained on the property. 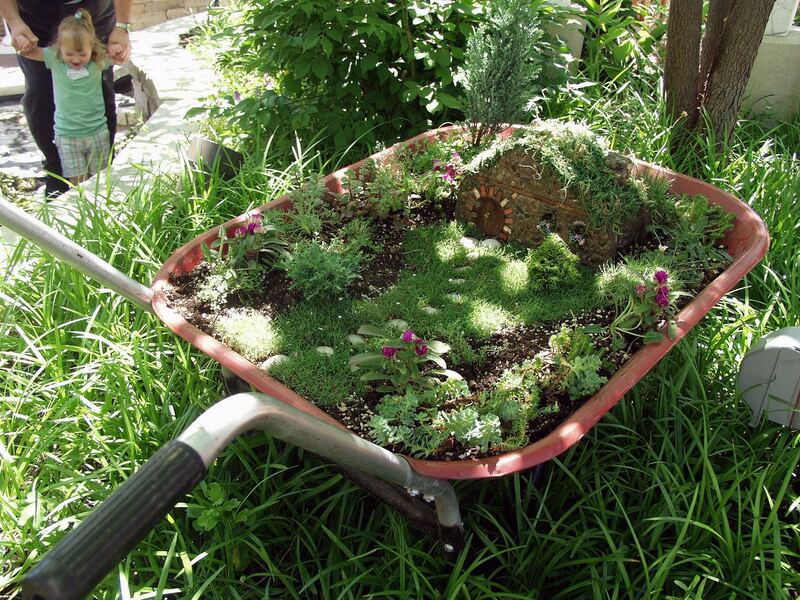 Including these in sand areas, along with plants, creates an even more stimulating play environment. 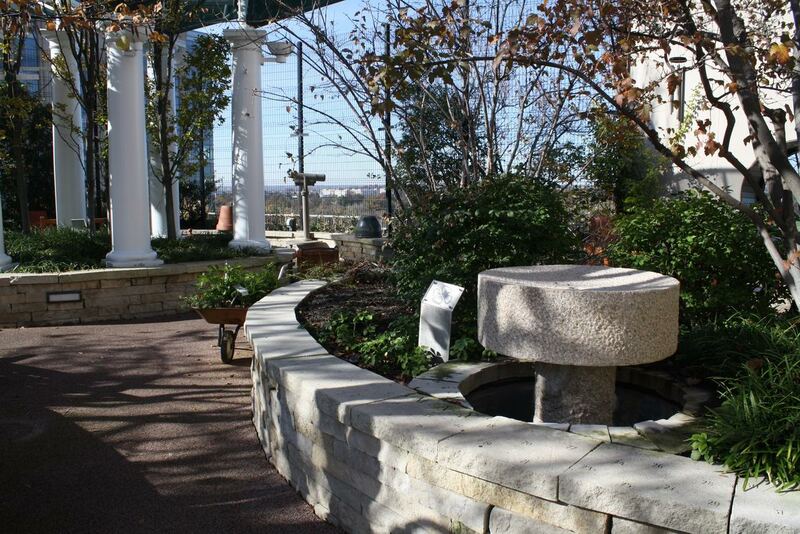 Some examples of uses for rocks and wood include raised stepping stones and stumps, seating areas, tables, and climbing objects. Several adjacent rocks could also be anchored into hillsides for added challenge and excitement. 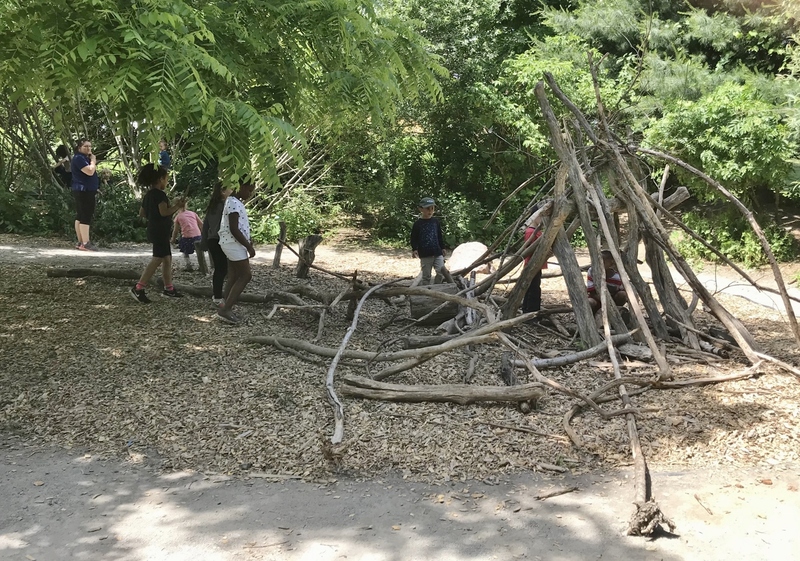 When children play in natural settings, they tend to be quite imaginative and create their own games, which makes the whole experience especially enjoyable. 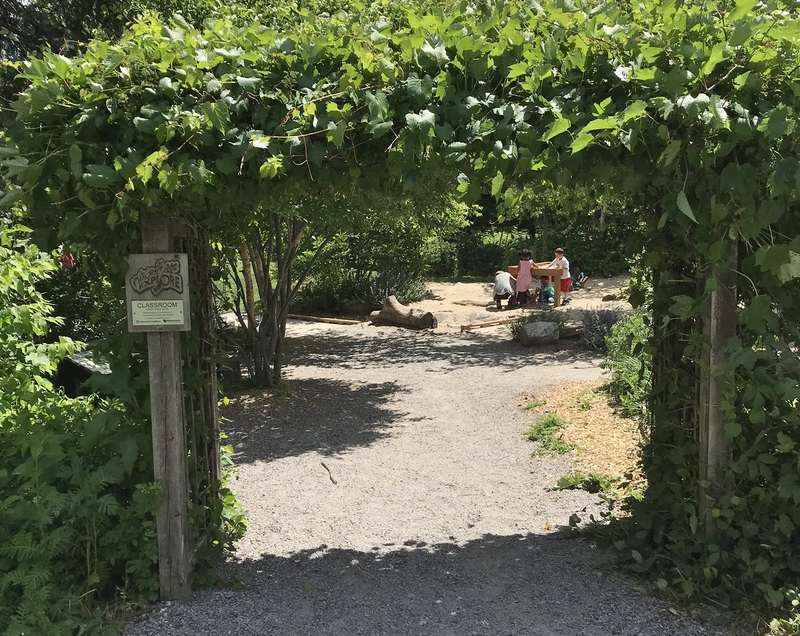 Including natural components in playgrounds is a great way to give children this exposure on a regular basis, and it is a relatively low-cost means of adding lots of play value.